Yes, here we go again, massive public ignorance post # I forget how many. This has been floating around out there for awhile but was on Rachel Maddow last night, and here is a link with suitable discussion of relevant facts from Dave Johnson, perhaps important as this silly sequester is about to land on us supposedly driven by the overwhelming need to get the deficit under control, http://blog.ourfuture.org/20130226/deficit-is-falling-dramatically-but-only-6-know-that . As it is, apparently 62% think it is rising, while 28% think it is constant. I was immediately concerned by the data sample: 20 advanced economies over 12 years. What's particularly distressing is that just over half of the sample countries are members of the euro zone. In choosing to study advanced economies, the authors specifically note the problem of "original sin" in studies of emerging markets—that countries which borrow in foreign currencies are subject to different debt dynamics—only to then use a sample in which most of the chosen economies are unable to print their own money. we calculate the level of the primary government surplus that would be necessary to keep debt from continually growing as a percentage of GDP. We argue that if this required surplus is sufficiently far from a country’s historical experience and politically plausible levels, the government will begin to pay a premium to international lenders as compensation for default or inflation risk. The authors rightfully worry about the U.S. polarized political system and our political will to increases taxes enough to cover spending and pay down the debt slowly over time. I have to seriously question, however, why an 80% percent debt/GDP ratio is the tipping point. Let me explain with a simple and perhaps pessimistic version of their model, which really harkens back to Domar’s modeling and Sargent and Wallace’s unpleasant arithmetic. Let’s assume that the real interest rate (r) = 3% and the long-run growth rate (g) = 2% so the present value of primary surpluses expressed as a percent of GDP (s) is given by s/(r – g) which is 100 times the primary surplus ratio given our unpleasant assumptions. How hard would it be for U.S. fiscal policy to have taxes as a share of GDP to exceed government spending as a share of GDP by say 1 percent so we could readily handle the current level of debt in the long-run? I’ve been looking over government spending and revenue figures as shares of GDP over the past 60 years. I prefer to do this as overall government spending and revenues (Federal, state, and local) as we know the Federal government could push certain responsibilities such as Medicaid off to the states if Ryan Republicans have their way or could assist cash strapped states with more Federal revenue sharing if I had my way. Recall that we did manage to pay down the massive Federal debt after World War II despite the fact that we had a larger defense budget as a share of GDP than we even saw under President Reagan or Bush43. OK, we have higher state and local government purchases now than we did in the 1950’s and transfer payments as a share of GDP have risen over time. But notice that in the late 1990’s, we did see total taxes as a share of GDP reach 31%. So can we get back to that level and keep spending at 30% of GDP? Well we did have government purchases drop below 18% of GDP in the 1990’s even as state and local purchases being 11.5% of GDP and nondefense Federal spending being 2.5% of GDP by telling the Pentagon that they get less than 4% of GDP. Oh, I know Republicans hated the decline of the military industrial complex but I would argue this is just smart policy. So the trick on the spending side will be to limit government spending on health care to 6% of GDP if we maintain Social Security benefits at 6% of GDP. While that will be a real challenge, the other challenge will be to find some political agreement on how to raise taxes as a share of GDP. We Democrats should admit that we are loathed to increase the tax burden on the working class even as that is really the Republican’s secret desire. And we know the Republican agenda is to insure that their rich political masters see an even less tax bite than they face today. But if we can get past this class warfare, avoiding fiscal default is something we know how to do. I had intended to write something about the strange empirics in this paper on the supposed dangers of our fiscal path, but then I figured that others, and certainly Paul Krugman, would take up the task, and I was right. So no additional criticisms. Nevertheless, the issue of US fiscal space is too important to be left to the ideologically blinkered. (There is no other explanation for the crude methods employed in Crunch Time.) No country’s fiscal space is unlimited, not even ours—or Japan’s for that matter. Here are four points to bear in mind. 1. The US borrows in its own currency, so it can’t be compared to countries that don’t. This is the core of the many published critiques of Crunch Time. 2. A second consideration is whether a country is a chronic surplus accumulator or deficit secreter. Japan, for instance, has had decades of surpluses (we are talking current account here), so there is a vast pool of domestic savings to draw on. Taken in isolation, this call would go against the US: we are the biggest deficit country in history. 3. But the third point is that it also matters whether a country issues a reserve currency—and, in the case of the US, the denomination that accounts for about two-thirds of the global total. As long as the US supplies the world’s primary money it has a lot of leeway to borrow. The dollar’s strength is bolstered by the absence, for the time being, of a credible alternative; in particular, it helps the dollar’s cause that the Eurozone has often resembled a suicide cult. 4. Past experience is no guide at all, because there has never been a situation like this in all of human history. We have a country that has run current account deficits ranging from large to mammoth for decades, that has large domestic debts, public and private, it cannot wind down, but also supplies the dominant reserve currency. We are playing it by ear. People are right to be worried, but this is not about fiscal deficits per se; the entire edifice of public and private debt in the context of continuing external deficits is unsustainable. I can only speculate, but my guess is that it will all end suddenly, unexpectedly and unpleasantly. 2008 didn’t do the job, so we are headed to another seismic event. Alas. My fantasy package, and I'm not running for office, would include a progressive consumption tax, and it would have chained CPI, and it would have a pretty big means-test of Medicare. Still, I have to chuckle when he complains about Obama not proposing a "politically plausible" plan, and then offers up an alternative that includes a progressive consumption tax, something that Republicans have been unrelentingly opposed to for decades in any reasonable form. In the current negotiations that David Brooks and Ezra Klein were discussing, it is clear what the hold up is. The President is willing to accept some spending cuts if the Republicans accept a few roll backs for the preferential tax treatment for capital income but the Republicans have been steadfastly opposed to anything that would raise the tax bite for the ultrarich. This is nothing new as this has been the political debate for over 30 years. And the next time you hear a pharmaceutical executive complain about rising tax burdens - remember that their effective tax rate is likely to be less than 25 percent. Now that the Third Reich’s annual film awards are almost upon us, we are hearing voices that object to some of the entrants, especially Leni Riefenstahl’s stirring “Triumph of the Will”. We have heard the objection, for instance, that Riefenstahl selectively showed smiling and enthusiastic faces, ignoring the many in the crowd who were bored, hostile or simply tired. They say this is rewriting history. Actually, this kind of nitpicking is little more than a pretext for debate over the politics of the movie itself. These critics don’t like Hitler, and they are using “Triumph of the Will” as an opportunity to make themselves heard. But this shows only that they don’t understand Art. Films are about entertainment and beauty, not truth. If they are true it is by accident. And this applies to all literature and art: was Shakespeare “true”? Karl May? “Triumph of the Will” captured the imagination of the public because of its beautifully composed imagery and cinematic rhythm. However accurate it might be about what actually transpired at that rally in Nürnberg, which is something we may never know, it did exactly what great movies are supposed to do. The critics, on the other hand, express their contempt for the movie-going public. They think that viewers are simply passive objects of government propaganda, unable to think for themselves. Maybe they have more in common with Herr Goebbels than they know. Invention remains one of the prerogatives of art and it is, after all, the job of writers, directors and actors to invent counterfeit realities. It is unfair to blame filmmakers if we sometimes confuse the real world with its representations. The truth is that we love movies partly because of their lies, beautiful and not. It’s journalists and politicians who owe us the truth. For the first time in my life I am going to praise George Will. I could easily spend an ultimately stupifyingly long (just like most of his columns) list of his erroneous and completetly stupid and ignorant columns that stretch so long, well; not worth the bother. So, I applaud George Will for standing seriously for human rights and liberty. Joe Nocera has a rather muddled column in today’s New York Times about why, in his view, stopping the Keystone pipeline would do little to forestall climate change. Along the way he confuses mitigation and adaptation and generally gets carts and horses all scrambled up. Abstracting from sequestration, mitigating the buildup of greenhouse gases means just one thing, leaving fossil fuels in the ground. The more we leave there, and the greater their CO2 equivalent, the less climate change we’ll have. Switching to green energy, achieving conservation efficiencies and all the rest is about how we can do this with minimum adverse impact to our standard of living—how we can adapt to what we have to do to mitigate. This is very basic stuff but easy to lose sight of. What this means is that making it economically impossible to develop the Alberta oil sands contributes to mitigation, as long as it’s not coupled in some way with greater exploitation of some other resource. So what happens if the Keystone pipeline is not approved? First, no Alberta tar sands, assuming the pipeline to the Pacific is stopped too. Second, greater scarcity of supply means some increase but certainly no decrease in the price for oil in the US. Hence at least some of the Alberta sands will not be offset, and competing supplies at the moment have a lower CO2 equivalence, so from a mitigation perspective it’s a clear gain. Of course, trying to keep oil in the ground one pipeline or coalfield at a time is an inefficient strategy; Nocera is absolutely right about this. Much better would be a permit system that restricted the amount of fossil fuel entering the US economy. Even a tax to restrict extraction and imports, as advocated by Hansen, would be a lot better. But the US is politically incapable of passing such a law over the next two years and probably at least two more years after that, so, with the greenhouse gas clock ticking away relentlessly, we have to do what we have to do. Stopping Keystone is a useful start, and it’s more than merely symbolic. Incidentally, why would Nocera say that “we are far better off getting our oil from Canada than, say, Venezuela”? Has he made a calculation about the economic good that US dollars would do in the pockets of oil sector workers and investors in Alberta compared to the social programs Chavez is funding with oil money in Venezuela? From a purely economic point of view, what difference does it make to the US current account deficit whether we exchange our dollars for loonies or bolivars? And if relations sour further between the US and Venezuela, does Nocera expect the Venezuelans to bankrupt themselves by refusing to sell their oil? (Try that strategy out on Iran.) Sorry to make such a big deal of it, but vacuous comments like this are truly annoying. From the beginning of 2002, when U.S. government debt was at its most recent minimum as a share of GDP, to the end of 2012, the dollar lost 25 percent of its value, in price-adjusted terms, against a basket of the currencies of major trading partners. the decline in the dollar under Bush probably had more to do with what was going on in our trading partners than with what was going on here. And in any case, again, it was not a problem for America. Of course those of us who were concerned about the trade deficit back in 2002 might have hoped that we would see a dollar devaluation that might increase net exports. One commenter at Paul’s place, however, argued that the trade deficit continued to increase even as the dollar fell. I checked the NIPA statistics as reported by BEA for how real net exports (2005$) behaved and sure enough, they rose to -$722.7 billion or 5.7% of real GDP by 2005 and were up to -$729.4 billion or 5.6% of GDP by 2006. But then the economy was expanding back in those days. Today, however, real exports are running at -$405.6 billion or 3% of real GDP per 2012. Cynics might say recessions do tend to lower imports and we’d hope that real GDP does eventually take off. A weak dollar, however, is not necessarily a bad thing especially when addressing a weak economy if it makes our goods more competitive in world markets. Of course, any good international macroeconomist would argue that we as well as Europe should be relying more on expenditure-adjusting policies than expenditure-switching policies to stimulate aggregate demand. But this realization seems to be well beyond the comprehension of Scarborough and his economic guru. My apologies for disappearing for several days; this is what happens when your teaching load bunches up on you. Anyway, on to TC. For those who may still care about this (and I realize the lifespan of topics in the blogosphere that people care about is measured in hours), I thought I noticed a Marginal Revolution post that exhibited elementary confusions about the income-expenditure identity in macroeconomics—as did Paul Krugman. The link to Cowen’s original post is here. I responded with this, Krugman with this, and Cowen with this. 1. Cowen followed the snip from Krugman with four paragraphs about how corporate money doesn’t just sit there but goes back into the economy, as if this called Krugman’s concern about the corporate cash hoard into question. This is what Krugman and I were pointing to. Someone who understands that income and expenditure (in a closed system) are identical, two ways of looking at the same transactions, doesn’t worry about demonstrating that money has to go somewhere. It’s not about “going”. 2. It is true that, in his fifth paragraph, Cowen raises the issue of consumer spending. If the other four paragraphs had never existed and he had written only #5, he would have a perfectly valid complaint. 3. Now that he mentions that paragraph and the chart that accompanies it, however, it is fair to point out that the data say exactly the opposite of what he says they do. After four tough years retail sales have returned to where they were before the collapse. At the moment they are growing slightly faster than the pace of the economy as a whole, but not much. In this they reflect our overall problem: the economy is growing in fits and starts but making hardly any progress in closing the output gap. 4. I’m sorry that Cowen has taken offense at my point about macroeconomic thinking being hard, even for professional economists. It is hard. If you go looking for comments by economists that exhibit muddle you will find plenty of examples. In the classroom I will think that I have just explained the system logic of macro in a perfectly lucid way to my students, and they will come back at me with papers and exams that show that my efforts at communication have failed. And there are times when I too have to stop and think, even sometimes draw little pictures to remind myself what is going on. As I’ve written elsewhere, the fundamental problem is that macroeconomics deals in both equations and identities, and they don’t mean the same thing, even though the mathematical manipulation is the same. Our brains work readily in equation mode, where x determines y, and not in identity mode where x is y. Although it has a zero chance of getting past a Republican veto in congress, it’s good to see a new climate bill sponsored by Bernie Sanders and Barbara Boxer. You need a concrete proposal to transform amorphous climate anxiety into political activism. The fate of this bill will have little to do with its actual strengths and weaknesses, but we should still size it up carefully, since politics often has a way of digging channels that it eventually has to follow. In some ways this is an evolutionary improvement on Waxman-Markey, which made it through the House in 2009 but died in the Senate. Like W-M, its centerpiece is a framework for putting a price on carbon, a sine qua non for organizing a comprehensive response to the buildup of greenhouse gases. Unlike W-M, it would position itself upstream, slapping a tax on fossil fuels as they leave the ground or enter the economy from abroad. This is a huge improvement: it would cover a wider swath of carbon emissions and would avoid all the loopholes and backroom dealing that sector-by-sector coverage practically invites. Also, it devotes three-fifths of all carbon revenues to per capita rebates back to the public. This is essential for several reasons: it is good macroeconomics (more predictable muting of the dampening effect of higher energy costs), good social policy (turning regressive fuel price increases into progressive redistribution), and good politics (countering the understandable fear of households that rising energy bills will slash their living standards). This is the right direction for policy. The brief summary posted on Sanders’ website doesn’t make clear how long or complex the bill is, but from the looks of it, it should be simpler and more transparent than W-M. That’s important too. However, there’s another possible comparison to make: Maria Cantwell’s CLEAR Act. This was introduced at the same time as W-M but didn’t get the endorsement of either the Democratic Party establishment or the major green groups. It was a much, much better approach. Rather than collecting money through a tax, CLEAR required permits to introduce fossil fuels into the economy, and these permits would be auctioned. Permits have two large advantages over taxes. First, the relationship between carbon prices and emissions is uncertain and likely to change over time. By setting one, you allow the other to fluctuate. If you are a climate hawk—and you should be—you want the price to vary and to control directly how much carbon we send up into the atmosphere. Permits do this. Second, as a practical matter, it will be difficult to pass a bill that does more than impose a token restriction on carbon emissions, at least initially. S-B, for instance, starts low at $20 per ton of CO2 equivalent and programs a very modest rate of increase over the next decade. In fact, it anticipates only a 20% reduction in emissions by 2025, not nearly what we need. By itself, that’s OK; just getting a framework is a big deal. But basing the framework on taxes means that, if we somehow manage to make S-B the law of the land, we are going to have to spend the next decade arguing for higher taxes on fossil fuels. That’s tough not only because of the politics of taxes, but also because taxes are connected to climate outcomes only through a chain of effects that is complex and imprecise. It would be much more powerful, politically, to be arguing about how much carbon to send up to the atmosphere directly, which is what you get from a permit system. There’s a reason Bill McKibben’s outfit is named 350.org and not, say, $120-per-ton.org. Also, CLEAR rebated nearly all of its revenues back to the public. Rebating some of the money is a good idea, and the more you rebate the better it is. That way you cover more of the public’s fears about energy costs, recycle more of the cost increases into other forms of demand, etc. Ah, you say, but what about all the investments in clean energy we need to make? Yes, we need to make them, but we don’t need any extra revenue: we could finance them almost entirely out of repurposing anti-environmental spending on fossil fuel subsidies, ag subsidies, a large portion of military spending, and so on. You can even see that, camouflaged, in S-B. It proposes to increase green investments of all sorts by $480B over ten years, along with ending fossil fuel subsidies—but then it would devote $300B of these savings (from ending subsidies) to reducing fiscal deficits. In other words, the majority of the money that could have gone into rebates is going into financing the government—and this is based on just one of many possible changes in federal spending. It is important to bear in mind that price increases for energy are highly regressive in themselves; so programming a more austere fiscal policy at the expense of lower income households is a double no-no. So there you are: we have a new starting point that’s better than the “official” proposal last time around but worse than its better competitor. The good and bad news is that we will have lots of time—at least two years and probably longer—to discuss what the best framework would look like. Since I recently poked at my friend, Dean Baker, let me agree with him strongly on a recent post of his dealing with an important issue widely ignored, the need to relax our strict immigration rules for physicians. It is widely agreed that the major threat to future US fiscal solvency is the rising cost of medical care. US physicians are paid on average $250,000 per year, more than twice what European ones are, and simply higher than any others in the world. If salaries were to fall to European levels, we would save $100 billion per year in medical costs. However, neither political party is pushing this, and it is rarely discussed among the many ideas that get put forward regarding controlling medical care costs. Almost certainly this reflects the power of the AMA with both political parties. A sign of this ignoring is a recent NY Times article on STEM immigration that Dean links to. He very reasonably points out how there is no mention of the physician issue, and indeed the US has a shortage of physicians, particularly of primary care ones. He has also long complained about high income professionals such as doctors and lawyers being for free trade, but imposing immigration restrictions on potential competitors for themselves. For more discussion, see http://www.cepr.net/index.php/blogs/beat-the-press/why-arent-they-talking-about-immigrant-doctors . Is Dean Baker Wrong About Robert J. Samuelson On the S&P Prosecution? I am usually in agreement with Dean Baker and jumping up and down on the case of Robert J. Samuelson of the Washington Post. However, in this case of Dean dumping on Samuelson for raising questions about the recently announced DOJ case against the S&P ratings agency for fraud back prior to the 2008 collapse, see http://www.cepr.net/index.php/blogs/beat-the-press/robert-samuelson-is-worried-the-justice-department-is-persecuting-sap , I am not fully in agreement with Dean. Dean accurately points out that all parties involved were convinced that the real estate bubble was going to continue, but that fraud may still have occurred as the S&P raters may have changed their business model and were rating derivatives and CDOs as AAA without any solid support. So, why I am defending the often indefensible RJS? It is not because of any argument that he made. The problems are two in my view. One of them, mentioned by RJS, is that this is awfully long after the alleged crime (which indeed I think happened) to be finally be getting around to this. The other, more important and not noted by either of them, is that this is the only ratings agency to be so prosecuted, with a very large fine being requested, one large enough to trigger a bankruptcy of S&P's parent company, McGraw-Hill. Why is S&P the only one so charged? What sticks out to me is that S&P was the agency that downgraded the US debt rating after the debt ceiling in 2011, much to the annoyance of the administration at the time. I happen to agree that this was somewhat questionable and obnoxious, although the breakdown of responsible decisionmaking in Washington was certainly something worthy of criticism, and it certainly was not illegal of S&P to make such a downgrade. But there is all together too much scuttlebutt that this prosecution is in fact in response to this particular action by S&P. They are being singled out among the various probably guilty ratings agencies for punishment possibly because they did something that annoyed the administration on policy grounds. This is arbitrary action that strikes me as being an inappropriate way to proceed. Either punish all of them, or none of them, and if punishing, then do it sooner after the alleged crime in question. This smells of a political payback. Why Aren’t Corporations Paying More in Dividends and Does It Matter to Aggregate Demand? I would understand it (though not quite accept it) if corporations were stashing currency in the cupboard. Instead, it seems that large corporations invest the money as quickly as possible. It can be put in the bank and then lent out. It can purchase commercial paper, which boosts investment. Maybe you are less impressed if say Apple buys T-Bills, but still the funds are recirculated quickly to other investors. This may not end in a dazzling burst of growth, but there is no unique problem associated with the first round of where the funds come from. If there is a problem, it is because no one sees especially attractive investment opportunities in great quantity. (To the extent there is a real desire to invest, the Coase theorem will get the money there.) That’s a problem at varying levels of corporate profits and some call it The Great Stagnation. The same response holds if Apple puts the money into banks which earn IOR at the Fed and the money “simply sits there.” The corporations are not withholding this money from the loanable funds market but rather, to the extent there is a problem, the loanable funds market does not know how to invest it at a sufficiently high ROR.If anything, large corporations are more likely to diversify out of the U.S. dollar, which could boost our exports a bit, a plus for a Keynesian or liquidity trap story. The problem is not that corporate money can’t find its way to ultimate investment, but that too much corporate money itself reduces the pull of final demand on the level of investment. The upshot isn’t that money disappears into cupboards, but that national income is lower than it would otherwise be. I was going to add my two cents with the first one being on why corporations would be hoarding cash – but then Noah Smith has done a fine job on that query. To throw in my other cent – let me temporarily don the hat of a Barro-Ricardian equivalence type. Suppose that shareholders were all very rational agents with no borrowing constraints and that they recognized that all this hoarded cash was their wealth. Whether the corporation issued dividends or not, their wealth is unaffected. So maybe these households would be consuming the profits be they hoarded in cash or issued out in dividends. Now I know this equivalence theorem does not necessarily hold up that well in the real world so we can talk about tax cuts stimulating consumption for at least households that do face borrowing constraints. We liberals therefore tend to argue that tax cuts for the working poor tend to have a larger direct effect on aggregate demand than tax cuts for the ultrarich. So if the shareholder were someone who was borrowing constrained, hoarding cash rather than paying dividends does depress consumption demand. Then again – we liberals also tend to argue that a lot of shareholder wealth is owned by very rich individuals as opposed to being owned by the working poor. Non-Ricardians are welcome to tell me where this line of thinking has gone terribly astray! I am confused by this argument. I would understand it (though not quite accept it) if corporations were stashing currency in the cupboard. Instead, it seems that large corporations invest the money as quickly as possible. It can be put in the bank and then lent out. It can purchase commercial paper, which boosts investment....If there is a problem, it is because no one sees especially attractive investment opportunities in great quantity. Ah, but why are these investment opportunities lacking? Could one of the reasons be that too high a fraction of national income is being funneled into corporate profits, rather than households inclined to spend it? What Cowen has trouble with is seeing all the pieces simultaneously in true macro fashion. The problem is not that corporate money can’t find its way to ultimate investment, but that too much corporate money itself reduces the pull of final demand on the level of investment. The upshot isn’t that money disappears into cupboards, but that national income is lower than it would otherwise be. I’m sympathetic with Cowen’s struggle: I see the same difficulties in my economics classes every year. Students can usually see only one or two linkages at a time; it is really hard to see the whole thing as one simultaneous entity. It doesn’t come easy even for professional economists, since writing a set of equations is one thing, but visualizing them on an intuitive level as an integrated system is another. The fact is, there are a lot more Tyler Cowen’s in this world than Paul Krugman’s, which is one reason why it is so difficult to get a sensible discussion of macroeconomic policy. But the social level is another story. Individuals take the array of risks as given; society can choose how much risk its members will face and what their risk-freedom tradeoffs will be, at least up to a point. If the objective is to minimize all risk of any sort, especially all risks to health and income, the result will be stultifying. But that’s not where we are on the Great Risk Curve. Rather, the debates we have are about whether to cut back or extend social insurance programs like Social Security and Medicare, social protections like TANF and Medicaid, and more or less regulation of finance, pollution and such. It seems clear to me that more security of this sort, which limits the downside risk individuals face in their personal lives, reduces the cost of living freely. There was no decrease in government spending during the fourth quarter of last year. In fact, the government spent more money between October and December of 2012 than it did during the previous two quarters. So federal spending actually increased during the 4th quarter. Nolte was complaining about how some claimed there was a fall in government spending reported in the latest GDP accounts. 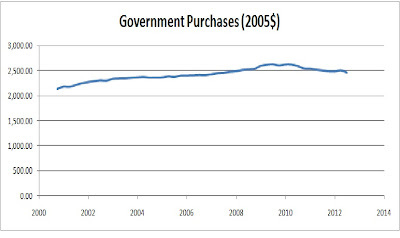 Of course, people should distinguish between government purchases (which did fall in real terms last quarter) and government spending which includes transfer payments as Barkley noted. But let’s make two other distinctions. My post yesterday linked to Federal expenditures on a seasonally adjusted basis which did show a sizeable decline even in nominal terms between the 2nd and 3rd quarter and a nominal increase that was less than inflation in the 4th quarter. 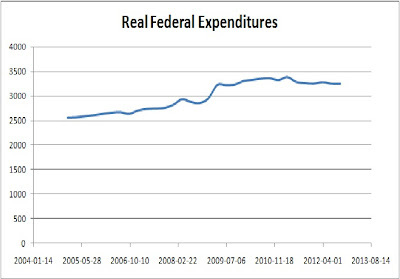 So in real terms, seasonally adjusted real Federal expenditures have fallen during the second half of 2012. In fact, they have been falling since their peak at the end of 2010. Perhaps part of the decline is attributable to the fact that the economy has slowly recovered but part of it is due to austerity, which of course, is terrible policy for an economy that still has a 6% GDP gap. And some in Congress want to cut government spending even more? There was no decrease in government spending during the fourth quarter of last year. In fact, the government spent more money between October and December of 2012 than it did during the previous two quarters. So federal spending actually increased during the 4th quarter. Would you like some facts to go with your media propaganda? What may be a problem here is that the public reports did not make this distinction, reporting on declines in "government spending," when in fact what is involved here has been a decline in government purchases. The crucial issue here is that changes in transfer payments do not directly affect GDP, but changes in government purchases do, and it was purchases, mostly through defense spending, that declined. But we should also note that Nolte presented Federal outlay data which exhibits seasonality. Which is why the government accounts also present the data with seasonal adjustments. Nolte’s observations don’t quite hold when we look at Federal spending seasonally adjusted. Public disgust with bankers is nothing new. In the fifteenth and sixteenth century the most powerful banking family, which took over much of power and influence of the Medicis. Their name, Fugger, became a slang word associated with rapacious behavior. It is interesting that PGL has posted a figure showing government purchases and how they have been gradually declining recently. The recent report of GDP surprisingly declining in fourth quarter 2012 and the role of government spending in that brings this up. What may be a problem here is that the public reports did not make this distinction, reporting on declines in "government spending," when in fact what is involved here has been a decline in government purchases. The crucial issue here is that changes in transfer payments do not directly affect GDP, but changes in government purchases do, and it was purchases, mostly through defense spending, that declined. Some readers may say, "What is the problem here?" 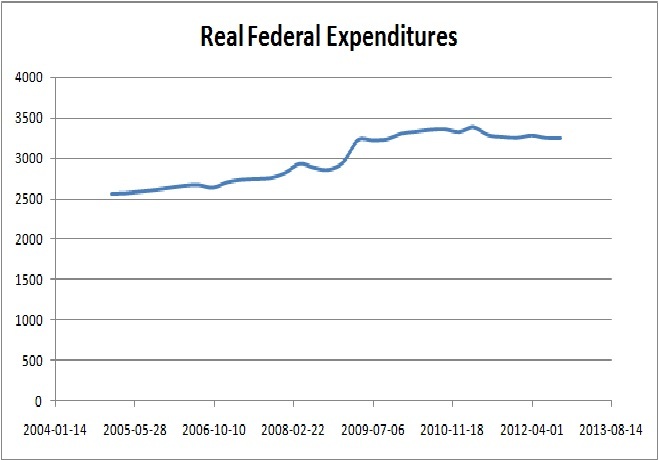 The problem is that a new right wing meme has erupted over whether or not "government spending" has declined. Indeed, it did not do so during the 4th quarter 2012, at least not federal government spending. Much as I dislike this source, one can see the numbers taken from US Treasury stats at http://www.breitbart.com/Big-Government/2013/01/30/Fact-Check-Federal-Spending-Increased-in-4th-Quarter . Furthermore, Barron's has gotten all huffy about how the Bureau of Economic Analysis reported the decline in defense spending, which indeed was mostly a decline in purchases leading to a decline in GDP. They complain that the 22% reported number for the quarterly decline was an annualized number, and that the actual decline was only 5.32%. This is accurate, but indeed, that decline in purchases by the DOD happened and was unexpected (although following a sharp increase in the 3rd quarter, thought by many to be a forwarding of spending in anticipation of the fiscal cliff/sequester/etc.) and played a major role in the reported GDP quarterly decline. In any case, the increase in federal spending noted by Breitbart was due to an increase in transfer payments that did not lead to an increase in GDP. As it is, people should be warned that this meme is now out there. I became aware of it when I saw the editorial page lead editorial in my very conservative hometown Harrisonburg (VA) Daily News-Record, which was going on about the government lying and Obama lying and so on and so forth, all on the basis of this report that in fact government spending had gone up rather than gone down as the media so widely reported. It would have been helpful if the original reports on this had been a bit clearer, although I suspect that much of the public is simply unaware of the distinction here or its importance. Meanwhile, everyone should keep in mind that the much bigger story here has been the ongoing decline in state and local government spending and purchases, with a far larger proportion of their spending being in fact purchases. Their employment is also much higher than that of the federal government, just over 19 million in comparison with about 4.4 million for the federal government, the latter peaking in recent decades at about 5.3 million in 1987 and reaching a recent minimum in 2000 of about 4.1 million. Since peaking in August 2008, government employment has fallen more than 700,000, with the overwhelming majority of that being in the state and local sector, with that decline still occurring in the last job report, where the gain of 157,000 jobs was after a 9000 jobs loss in the government sector, again, mostly state and local. Federal employment has not changed much in this whole period, increasing some in 2009 and slightly decreasing since, although that could change if there continue to be substantial declines of federal government purchases. I didn’t see Meet the Press, and there doesn’t seem to be a transcript available yes, but I hear that Paul Ryan declared it a proven fact that Keynesian economics has failed — and was, of course, not challenged on that assertion. GREGORY: Yeah, I know. A lot of centrist economists who may disagree with you in some areas but agree about the imposing or the impending debt crisis. Some on the left like Paul Krugman disagree. He calls you a deficit scold and he calls you worse than that. But his point is that-- that you’re being alarmist about the deficit and its relationship to how the economy performs and how the economy grows. So here’s what he wrote in his column on Friday and let me get you to respond to it. “It was, in fact, a good thing that the deficit was allowed to rise as the economy slumped. With private spending plunging as the housing bubble popped and cash-strapped families cut back, the willingness of the government to keep spending was one of the main reasons we didn’t experience a full replay of the Great Depression.” And this balance now between austerity, which he believes you call for, and appropriate investment on the part of the government is still where the great tension is. REP. RYAN: Well, we can debate the efficacy of changing economics or not and I don’t obviously believe-- I think that that is pretty clear, it doesn’t work. We’re not preaching austerity. We’re preaching growth and opportunity. What we are saying is if you get our fiscal shift fixed, you preempt austerity. That’s the-- here’s what a debt crisis is. A debt crisis is what they have in Europe, which is austerity. You cut the safety net immediately. You cut retirement benefits for people who’ve already retired. You raised tax and slow down the economy, young people don’t have jobs. That’s the austerity that comes when you have a debt crisis. And when you keep stacking up trillion dollar deficits like this government is doing, it’s bringing us to that moment. Our job, our goal is to prevent and preempt austerity so we can get back to growth. I guess it took MTP a week to post this transcript given how incredibly embarrassing it really is. 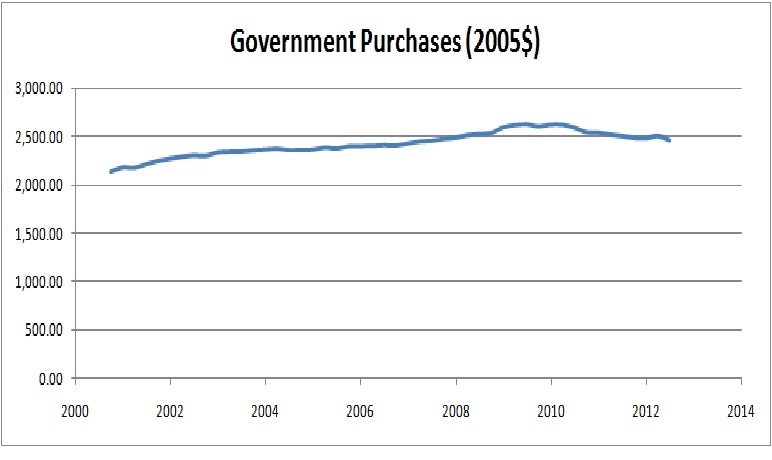 Let’s start with the fact that we have been cutting government purchases (austerity) for the past couple of years, which is a major reason why the recovery has basically stalled. But Ryan is calling for more government spending cuts so we can avoid austerity? Does this alleged GOP economic guru even know what the word austerity means? A question thrown my way yesterday got me thinking about what my views are on socialism today. (They keep changing.) Here is a quick summary, more for getting my thoughts in order than to satisfy whatever interest there may be out there in blogland. 1. Objectives. There are four areas in which capitalism often falls short and which might be served better by fundamental economic change. a. A poor balance of intrinsic and extrinsic motivation. For me, extrinsic motivation is a precise way to characterize psychological alienation. A world in which people are motivated to live their lives as intrinsically as possible is, all else equal, offers a better, more meaningful way of life. Of course, lots of important activities can’t be reliably left to intrinsic motivation, so this is not an all-or-nothing issue. It seems clear to me, however, that we could have a much better balance than we now see. Of course, intrinsic motivation is also linked to other issues, like the perceived fairness of the organizations we take part in and the reasonableness of what these organizations do. b. Equality. For an egalitarian like me, more economic and social equality is better, again all else equal. Equal doesn’t mean “same”, of course. We will continue to live, as we should, in a highly differentiated world, but it doesn’t have to be so hierarchical. As with motivation, there are practical tradeoffs to take into consideration with equality; whether or not we face a tradeoff today between greater collective prosperity and greater equality (probably not), as equality is increased such a tradeoff must inevitably appear. But to say that absolutely perfect equality is unattainable is not to say that we couldn’t thrive in a much more equal world. c. Social control over economic life. It is essential that our economic activities, which, as technology develops, become ever more far-reaching in their effects, be subjected to broad social control. As a starting point, however, it is important to recognize that the market can quite often serve as a perfectly adequate mechanism of such control. To take an example, think about the problem of producing shoes for a population with a wide variety of foot shapes and sizes. I believe the market does a creditable job of generating and distributing an assortment of shoes that meet this collective need for diversity, both statically (existing technology) and dynamically (encouraging an appropriate level of effort in the development of new technologies for making footwear production more flexible). This is a matter of some interest to me, because I have oddly-shaped feet. (Note that I’m restricting the issue to the problem of foot diversity, not to the different question of whether everyone who needs some sort of footwear can get it.) On the other end of the spectrum, the market is doing a terrible job of propelling us into a desperately-needed transition to carbon-free energy, with all it entails for infrastructure, residential and commercial location, patterns of consumption, and other related matters. Arguably, there are many other, if perhaps less pressing, aspects of economic life that call out for greater social direction. In connection with this point, it should be mentioned that there are two interrelated dimensions to social control. First, this entails the formation of the “social” itself, the achievement of we-ness, jointness of purpose, in a society of (ideally) free individuals. I certainly don’t expect that we would or even should arrive at a monolithic unity at the level of society as a whole; a desirable social-ness would be a mosaic of cross-cutting social groups, with individuals experiencing multiple affiliations. You might consider this an extension of Tocqueville’s observations on association or Dewey’s reflections on democracy as a way of life. It sounds rather airy and abstract but takes very practical, material form in the social institutions we create or could create in the ordinary course of life. The second element is “control”, which, the closer you look at it, the more slippery it becomes. As I’ve written elsewhere, ownership does not determine control in the modern world; control is multifaceted and inheres at all levels of economic life, from the most granular (a work team) to the most systemic (like a market). Social control suggests something like a stakeholder economy, but with a much more developed, encompassing and democratically constituted set of stakeholders and a variety of mechanisms that incorporate them at all levels of the system, as is practical and meaningful. But not too many meetings, please: the resources for democracy are limited and should be allocated to their most important uses. d. Class politics. When I’m feeling optimistic, I can imagine all the problems of capitalism being fixed by incremental tweaking, except one, the overweening power of the capitalist class. A system of private ownership undertaken for profit cannot avoid creating a small group, a 1% of the 1%, who command an outsized portion of society’s wealth and can use it in a variety of ways to influence the political process. One reason it is difficult to make progress on the preceding issues is the grossly disproportionate power of this minuscule group. Nearly every proposal for circumscribing this power has been adopted somewhere on the planet, but no country has managed to actually tame it. This may be the single negative feature of capitalism least amenable to reform. In principle, I identify socialism with progress on these four fronts and not with any particular institutional forms. a. Economic, political and social life are unimaginably complex, and our knowledge of how they work is spotty and often in error. In order to avoid unintended outcomes, we should take small steps, learning as much as possible along the way from our successes and failures. This is the logic of adaptive management. b. Small steps usually entail less conflict and especially less violent conflict. Violent conflict is bad for three reasons: it is harmful in itself, it results in chaotic situations whose outcomes are difficult to predict and control, and it typically institutes a dynamic of repression and exclusion that poisons the forms of democratic participation that a desirable socialism requires. There are also two general arguments for radical, systemwide change. a. Because of the interconnectedness between elements of the economic system, it may be the case that multiple, simultaneous changes are feasible while piecemeal changes are not. This is an application to social change of the logic of interactive nonconvexity. b. One possible lesson of history is that opportunities for significant change come infrequently and should be used to their fullest. Reformism might be the right strategy in a world of open, democratically responsive politics, but that is not the world we live in. Change should push up against its political limits and not be self-limiting. As you can see, these are not finished propositions but ways of framing questions. In fact, I would distrust any set of answers that are held to apply in every situation we might find ourselves in.